Remote Monitoring Systems - Northeast Water Solutions, Inc. State-of-the-art monitoring systems provide 24/7/365 system monitoring, operational analysis, pre-alarm alert and alarm notification. NWSI offers comprehensive remote monitoring capability focusing upon small community, industrial and commercial water and wastewater treatment systems. Utilizing state-of-the-art instrumentation and electronic communications technology, customized monitoring systems are developed to provide 24/7/365 system monitoring, operational analysis, pre-alarm alert and alarm notification. 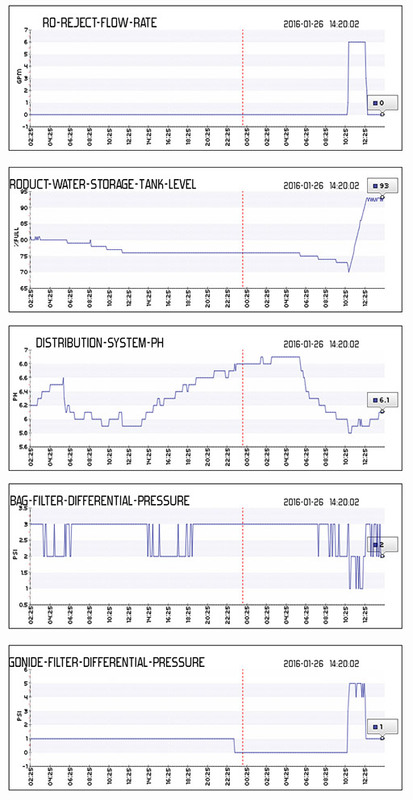 NWSI Remote Monitoring not only provides continuous status monitoring, it also allows trend analysis and response to prevent problems from occurring. In the event a problem does occur, the NWSI Remote Monitoring system provides immediate operator notification and response, as well as documentation of the trouble event. This provides enhanced system operational and physical security and safety, as well as protection of public health. Systems can also provide customized reporting and data logging/analysis, customer access via secure internet connection, customer inquiry request, regulatory reporting, etc. Distribution Pump Operating Status, Operating Hours, etc.